Chris Holbrook is his name and setting records in his game. Cobra Jet pilot Holbrook is a familiar face at NHRA events, where he roars down the strip in his Watson Racing and Varsity Ford-backed Cobra Jet. 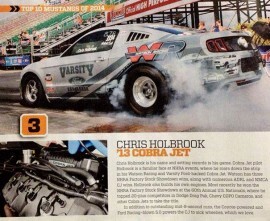 Holbrook has thee NHRA Factory Stock Showdown wins, along with numerous ADRL and NMCA CJ wins. … voted #3 in the TOP 10.